This 2-day event is intended for those companies willing to expand their knowledge on the latest and most up-to-date insights on the future of Open Data Standard and understand how this tool could boost their business. The fC2 Acceleration Outreach Programme will also allow participants to strengthen their network and meet potential partners and clients. Is the frontierCities2 Acceleration Outreach Programme for you? Are you interested in knowing how you can engage international clients? Are you looking for investors for your app? Are you looking for a special training programme on how to attract public and private customers? Would you like to receive tailor-made advice from our accelerator coaches? Would you like to meet with potential partners and clients? Would you like to listen to inspiring talks and speeches? If the answer to those questions is “yes” then the frontierCities2 outreach events and FIWARE Global Summit is the perfect event for you and your business! This outreach programme is exclusive to the companies supported by the A16 accelerator programme and phase I and II research results. To register for the frontierCities2 Acceleration Outreach Programme, simply fill in the following application form. Want to know how FIWARE technology provides much flexible and cost-effective smart city mobility solutions? Listen, to the three frontierCities2 grantees talking about the benefits their solutions are bringing to society, as well as saving money to cities and even save lives.Ethical citizenship, air pollution and noise pollution are the topics for a fascinating discussion. Click HERE to listen the FIWARE Podcast. The 14 frontierCities2 selected companies were participating in the Malaga FIWARE Tech Summit, 28 & 29 November 2017. The 6 MAG companies: Communithings, GreenApes, Open Move, SaMMY, Save-a-Space, Telocale, were showcasing their application in the exhibition area, together with the FI-TECH companies Ciclogreen and Atekenea. They were part of the 21 powered by FIWARE companies that were in the exhibition area. Tuesday 28th November, the technical sessions and main conference were attended and the day was closed with a networking cocktail. The FI-TECH start-ups appreciated the different training session and support provided during the Summit. Wednesday morning the fC2 MAG2 was launched in the opening session were held at the FIWARE Tech Summit. Each fC2 group attended their second BootCamp. For the MAG entrepreneurs was the Marketing & Digital Communication BootCamp, and for the FI-TECH the FIWARE Technical Support BootCamp. We would like to thank the FIWARE Foundation for their organisation and support previous and during the FIWARE Tech Summit. We are already looking forward to participating to the coming FIWARE Summit next year in Porto. The second call for proposals MAG2 will be launched on Wednesday 29 November 2017 at the FIWARE SUMMIT in Málaga! 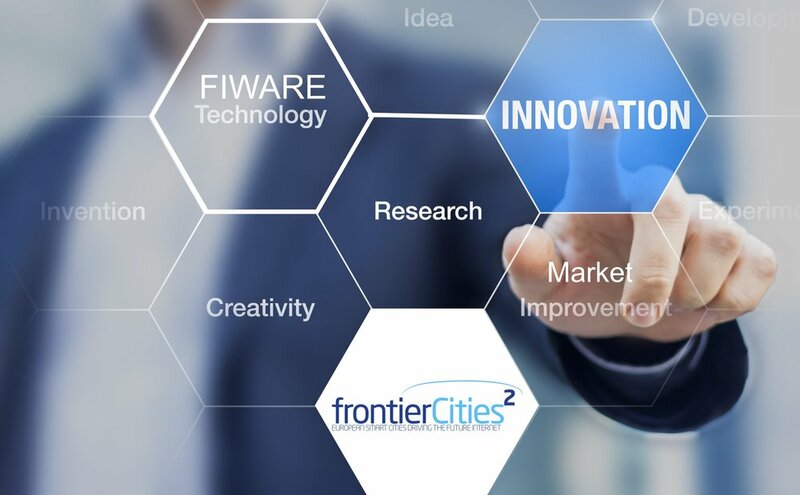 frontierCities2 Accelerator is glad to inform to all FIWARE community and newcomers that the second Market Accelerator Grants for Smart Cities is ready to be launched. We are looking for Start-ups and SMEs that have already developed a FIWARE application in the area of Smart Cities, and are willing to make their FIWARE application grow and gain European market and beyond. The MAG2 grant ranges from 25,000 euros to a maximum of 75,000 euros per participant. There are 300,0000 euros to complete the frontierCities2 MAG Acceleration programme. 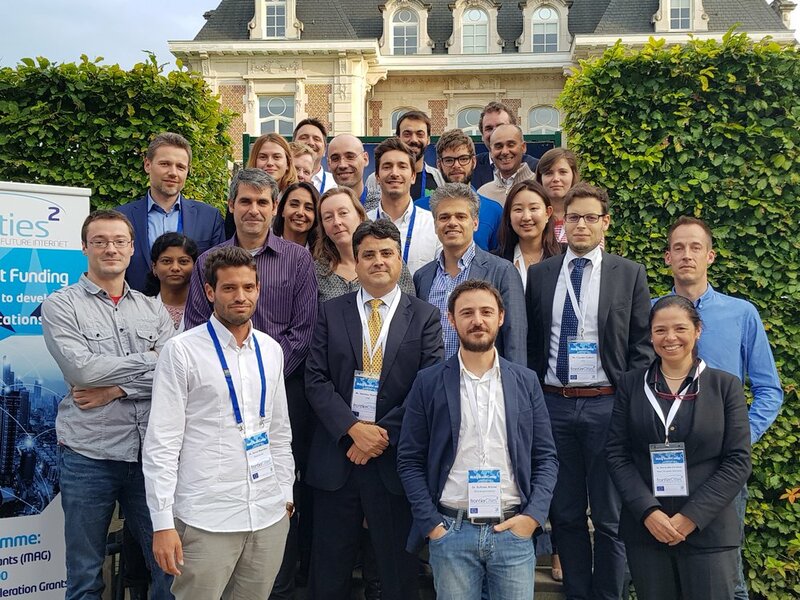 On September 18th the frontierCities2 consortium gathers on the B19 Country club for a day, to update the status of the fC2 Accelerator and plan the coming implementation of the months ahead. Participated to the consortium: New Frontier Services (Seán Burke, Dr. Bernardita Cárdenas, Giulia Monti, Soohyun Lee, Pauline Duchêne), FIWARE Foundation (Stefano De Panfilis), University of Surrey (Dr. Bill Headley), S3Transportation (José Papí, Raffaele Alfonsi), Innova BIC (Alberto Soraci, Tonia Sapia), Smart Transportation Alliance (Antonio Montalvo, Claudio Caferri) and H3BM (Luis Hill, Kevin Borras). The discussion included the fC2 contract amendment updates, application status, call & selection results reporting, fC2 grant management, communication, information sharing and dissemination plan with the presence of all the Consortium members. Also, the Consortium agreed to the assignment of the lead commercial coach and technical coach for each of the MAG & FI-TECH grantees, and Consortium Members decided on the grantees’ progress reporting system. The 3rd frontierCities2 Consortium meeting ended on a high note with frontierCities2 Secretariat thanking Consortium members for participation, dedication, and engagement. The frontierCities2 Accelerator successfully delivered in Brussels back to back – the MAG 1st BootCamp on 19th-22nd and the FI-TECH 1st BootCamp 23rd-24th September 2017. The “frontierCities2 – Another Level of Impact” Accelerator provides EUR 1.6 million in grant funding across two Open Call strands (Market Acceleration Grants, Development & Acceleration Grants), further developing the range of available FIWARE-enabled smart mobility solutions, while broadening into other Smart Cities areas. In total 14 grantees in the sector of Smartcities were invited to the 2-days MAG & FI-TECH frontierCities2 Bootcamp where renowned coaches were gathered to train them and challenge their ideas of innovation. The grantees were given an opportunity to learn about frontierCities2 Grant Management, Presentation on Investment Readiness, Business Model, KPIs, 10 Types of Innovation, and how to write their Inception Report. On the second day of the Bootcamp, 1on1 coaching session was also provided to grantees with more customised and tailored training. The frontierCities2 calls are now closed! The Market Acceleration Grant (MAG) and the Development and Acceleration Grant (FI-TECH) are closed. Both calls for open applications started on 1 March 2017, initiating the selection process of frontierCities2 Acceleration programme. For the MAG call, enterprises needed to have already trialled their FIWARE solution when submitting their application. This requirement obviously reduced the number of completed applications received but ensured that the submitted solutions were market- and customer-ready. For the FI-TECH call, beside submitting a Smart City solution using the FIWARE technology, enterprises needed to provide letters of commitment from third parties interested in their product and willing to trial their solution. The third parties could be town halls, public organisations and different industries that will directly benefit from tailored and free Smart City solution. On 24 April, the frontierCities2 MAG call for applications closed. The largest number of applications came from Italy followed by Spain. On third place, there are Portugal, The Netherlands and Germany. Followed by Belgium France and Israel in fourth place. The FI-TECH call received applications from 14 different countries. When the clock struck at 18:00 in Brussels on Tuesday 2 May and the call closed, Italy was still ahead with the number of finalised applications submitted. However, unlike the MAG call, they shared first place with Spain who submitted just as many applications to the FI-TECH call. Well done to both countries for their entrepreneurial spirit. The frontierCities2 team of evaluators still have to assess the applications received, so it remains to be seen which country ends up having the biggest number of applications funded under the frontierCities2 programme. We will keep you updated with the most recent developments of the frontierCities2 call results in our upcoming newsletters. In total, we have received 62 applications for FI-TECh and 53 for MAG. This information is based in the applications that have provided their location, as there are 21 unknown applications. This numbers will change as both calls are still open. The last frontierCities2 consortium meeting was held last 10 April in Brussels (Belgium). Do not forget to join the fC2 events in April! frontierCities2 is organising a number of events across Europe to promote the fC2 calls! frontierCities2 participated in the first-ever FIWARE Summit, held in Málaga (Spain) last 13-15 December 2016. The event built on an expanding network of 45 cities currently trialling or deploying FIWARE-enabled solutions.